We're only around for dinner for a couple days this week, so no need for a weekly menu or farmers market trip. 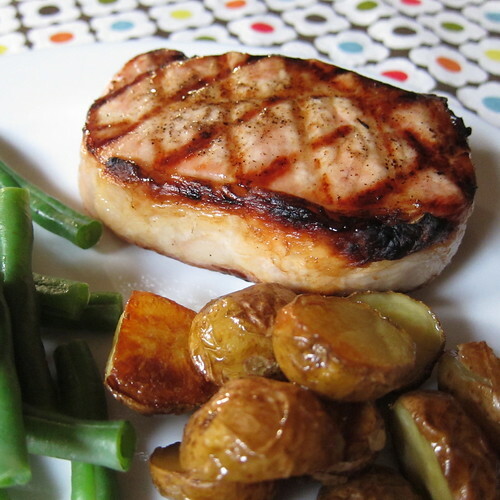 Instead I'll start your week off with Matt's latest grilled concoction, "Old Fashioned" Pork Chops. These are not old fashion pork chops, these are pork chops marinated in the ingredients for Matt's favorite cocktail, an Old Fashioned. Sometimes I feel like you can't really taste the flavors of a marinade in the finished meat, but that is not the case with this one. It's not they they are over-powering, instead you can taste the different components and how well they compliment the pork. I don't particularly like to drink bourbon, but apparently I really love it on pork. Plus, no dry pork here, these chops came out juicy even thought a little more well cooked than we planned. Mix the juice, bourbon and bitters together. Pour in a ziplock bag and add chops. Seal getting as much air out as possible. Marinate in the fridge for 4 - 6 hours. Remove the chops from the marinade. Season with salt and pepper. Grill to desired doneness. Those look perfect to me! I just love a good pork chop. This orange juice and bourbon glaze sounds amazing! Brilliant! Pork goes so well with bourbon! I was raised on pork chops. I love 'em. I like the glaze idea.